The Obama administration is caught on the horns of a dilemma. On the one hand, it has welcomed the Gulf Security Dialogue (GSD) as a chance to further "mutual interests" with Persian Gulf states, but, on the other, it has sought pragmatic engagement with the Islamic Republic—the greatest threat to gulf security. Michael Knights, a Persian Gulf expert at The Washington Institute for Near East Policy, noted in September that the "rapid advances" of the military forces of the Gulf Cooperation Council (GCC) were the result of the dialogue. He predicts that they "may eclipse Iranian capabilities in the gulf within ten years." Yet the GSD's initiatives are inadequate and need a foreign policy that stresses relationships and ideals. If policy within the gulf is to be dominated by short-term pragmatic demands, it may turn out to have unwanted consequences for other alliances in the region. That in turn could well have a negative impact on the United States. In 2007, Iran signaled its extraterritorial ambitions by capturing fifteen British sailors in Iraqi waters and holding them for nearly two weeks. One of the British marines is seen in footage from Iran's Al-Alam television network, April 1, 2007. 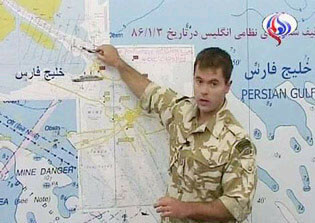 Iran claimed the sailor was pointing to a map of the Persian Gulf to indicate where the captured British ship allegedly crossed into Iranian waters. Twenty percent of the oil traded in the world flows through the Strait of Hormuz every day. Although U.S. politicians may dislike allowing oil to shape foreign policy, control of the strait is no matter of indifference. Closing the strait would cut the gulf's oil traffic in half. Some argue that even discussing such a possibility gives Iran leverage. But that is hypothetical. The real leverage that the Islamic Republic would have if it controlled the strait would be disastrous for the region and the West. The United States needs to wrest back control of the region. As the Islamic Republic spreads its influence, its immediate hinterland across the gulf is becoming increasingly vulnerable. The gulf is vital to Western oil supplies. When a regime that is utterly dedicated to the destruction of all Western influence and the elimination of the state of Israel has nuclear warheads in its reach, the Western powers need to do something quickly. Doing something means developing policies between the United States on the one hand and the six countries that form the Gulf Cooperation Council on the other. The principal mechanism through which all seven parties can engage in discussions about security, arms sales, and other relevant issues is the Gulf Security Dialogue, launched in 2006. The GSD was designed to provide a framework within which the United States and its allies can engage in six areas: (1) GCC defense capabilities and interoperability; (2) regional security issues; (3) counter-proliferation; (4) counterterrorism and internal security; (5) critical infrastructure protection; and (6) commitments to Iraq. The question is: Does the Gulf Security Dialogue provide sufficient strength and protection to those most immediately faced with the Iranian threat? Iranian assertiveness in the Persian Gulf continues to vex the United States and its regional allies. In 1988, as the U.S. Navy escorted commercial traffic through the gulf, an Iranian-laid minefield struck the USS Samuel B. Roberts and wounded ten sailors. The United States retaliated with Operation Praying Mantis, which overwhelmed Iran's naval and coastal facilities. In 2004, Iran's deputy oil minister accused Qatar of producing more than "her right share" from a natural gas field shared with Iran. Three years later, Hossein Shariatmadari, head of the government's flagship publication Kayhan Daily and an appointee of Iranian supreme leader 'Ali Khamenei, wrote that Bahrain was more a province of Iran than an independent country. The theme has persisted in Iranian discourse. Just this past February, for example, Ali Akbar Nateq-Nouri, the influential former speaker of the Iranian parliament, repeated Iran's claim to sovereignty over Bahrain. In 2007, Iran signaled its extraterritorial ambitions by capturing fifteen British sailors in Iraqi waters and holding them for nearly two weeks. Bringing back memories of the capture of the U.S. embassy in Tehran and the mass hostage taking that followed, this was also intended to show Iran's heedlessness of international law and its penchant for the humiliation of its enemies. In January and April of 2008, incidents between U.S. ships and Iranian speedboats highlighted Iran's asymmetric threat to maritime security. In July of 2008, Iran opened a maritime office on the Abu Musa islands, which the United Arab Emirates (UAE) contested. In September of the same year, Iran assigned the 20,000-man Islamic Revolutionary Guard Corps (IRGC) navy rather than the less confrontational regular navy to Persian Gulf defense and opened a new naval base on the strategic Strait of Hormuz the following month. It has since upgraded its Assalouyeh naval base, establishing "an impenetrable line of defense at the entrance to the Sea of Oman," according to an Iranian admiral. The IRGC navy alone has more than forty light patrol boats and ten guided missile patrol boats. The regular navy has five mine vessels, six submarines, and twenty-six support ships. Last September it added to its mostly outdated fleet of five major surface combatants by launching the homemade Sina class warship. The mix of past aggression and current military buildup gives weight to an Iranian foreign ministry official's explanation of how Iran would respond to a U.S. attack: "Ballistic missiles would be fired in masses against targets in Arab gulf states and Israel." In June 2009, Mohamed El-Baradei, former International Atomic Energy Agency (IAEA) chief, summarized the unspoken message Iran would like to send the region: "Don't mess with us; we can have nuclear weapons if we want it." Concern about Persian Gulf security spans administrations. The U.S. Navy enhanced its presence in the gulf in 1970 during Britain's withdrawal from the region. Throughout the 1970s, Washington relied on the "twin pillars" of Iran and Saudi Arabia to police the Persian Gulf and check the pan-Arabism of Egypt's Gamal Abdel Nasser. But it was only in 1987, when the U.S. Navy launched Operation Earnest Will to reflag Kuwaiti tankers traversing the Strait of Hormuz, that the United States used direct military force to protect the gulf. Three years later, the United States responded to Iraq's invasion of Kuwait with a massive buildup of forces. In the wake of the 1991 Operation Desert Storm and the liberation of Kuwait, Washington ditched its old "balance of power game" for dual containment, an attempt to isolate and weaken economically the aggressive regimes in Iran and Iraq. The U.S. military presence in the Persian Gulf rose through the 1990s as Iraqi president Saddam Hussein defied U.N. Security Council resolutions, and the Islamic Republic used proxy groups to threaten regional security. In 1995, the U.S. Navy assigned its Fifth Fleet to the naval support activity base in Bahrain—a base which it had used in one capacity or another for a half century. By 2003, the United States share of the Persian Gulf's arms supplier market reached an unprecedented high. The 2003 overthrow of Saddam Hussein's regime in Iraq raised the U.S. partnership with the GCC states to a new level. Qatar continues to host a regional headquarters for U.S. Central Command, and Kuwait enables the Pentagon both to base and transit troops through the country. This may give the impression of secure alliances and strong collaboration, but the truth is that the GCC states are vulnerable. With the exception of Saudi Arabia, none have strategic depth. Their armies are small: Iran's army has a total manpower of more than 540,000 compared to a combined GCC total of 176,500. While Iraq today is no longer a military threat, Kuwait's 1990 capitulation in the face of an Iraqi invasion in less than a day underscores the difficulty any GCC state would have against a determined onslaught. Nuclear armament could enable Tehran to "dictate oil policy" and "embolden extremist groups," according to Tariq Khaitous, a Middle East security expert at the Washington Institute for Near East Policy. President Bill Clinton's 1999 Cooperative Defense Initiative (CDI) was an effort to minimize these weaknesses by increasing defense integration and information sharing between GCC states, Egypt, and Jordan. It proposed enhancing active and passive defenses by promoting bilateral and multilateral initiatives. The CDI identified Iraq and Iran as major threats to the region and emphasized vulnerabilities to ground invasions, missile strikes, and chemical or biological attacks. With the CDI's prodding, all six GCC states signed a joint defense pact in December 2000. Yet cost concerns and differences in threat perception limited the follow-through. Even after Saddam's removal, pledges to triple the joint-force's troop strength and develop shared early warning systems have remained unfulfilled. On May 12, 2006, the State Department announced that Secretary of State for Political-Military Affairs John Hillen was to visit the Persian Gulf "to discuss regional security and defense cooperation with friends in the region." This marked the beginning of the U.S.-GCC Gulf Security Dialogue, which Hillen characterized as "defensive, defensive, defensive." Talks between U.S. and GCC security officials continued the following October when the United States led naval exercises in the Persian Gulf with Bahrain's unprecedented participation. That November, Hillen said the dialogue was "not part of any big picture reexamination of the Middle East strategy." Rather, it was a revamped commitment to "missile defense" and "boosting the capabilities of U.S. allies." Secretary of Defense Robert Gates has defined the six pillars of the Gulf Security Dialogue as defense cooperation, rehabilitation of Iraq, regional stability, energy infrastructure security, counter-proliferation, and counterterrorism. These pillars renew the Clinton Cooperative Defense Initiative's goals, such as improving missile defense and systems integration. But more importantly, they put the talks into a post-9/11, post-Saddam context in which Iran—with its nuclear program and support for terrorists—is seen as the main threat to gulf security. Even if Iranian missiles and terrorist attacks are not aimed directly at the gulf states, their destabilizing threat to the Middle East as a whole is unsettling enough. As Iran's regional aggression grows, so does the need to strengthen the GSD's pillars. Signs of the Gulf Security Dialogue's implementation came in early 2007 when the Bush administration announced it would send a second U.S. aircraft carrier group to the Persian Gulf, extend the deployment of Patriot antimissile batteries in Kuwait and Qatar, and increase intelligence sharing with the Persian Gulf states. Annual multilateral exercises in the spring of 2007 offered an opportunity to put the GSD's goals of interoperability and information-sharing into action. These included the world's largest mine countermeasure exercise (Arabian Gauntlet in Bahrain) and a missile defense operation with full GCC participation (Eagle Resolve in Qatar). These exercises fit Secretary Gates's vision of the GSD as "a strategic framework designed to enhance and strengthen regional security." As part of the GSD, President George W. Bush's administration announced US$20 billion in arms deals for the Persian Gulf states in July 2007, a huge upgrade given that the total value of U.S.-delivered arms and services to GCC states had been $72 billion between 1981 and 2006. Secretary of State Condoleezza Rice praised the proposal, saying that "the United States is determined to assure our allies that we are going to be reliable in helping them to meet their security needs." In the following months, Saudi Arabia ordered more than $1 billion in vehicles and radar equipment, and Kuwait bought over $1.3 billion worth of Patriot advanced capability (PAC-3) air defense missiles. In 2008, the United Arab Emirates ordered a $7 billion missile defense system never before sold to another country. Together, such sales give the GCC an edge against Iran. However, delivery of much of this equipment is still pending. The Arms Export Control Act requires the president to notify Congress thirty days before finalizing arms deals and allows Congress to block deals up until the point of delivery. In addition to its PAC-3 order, Kuwait is awaiting three L-110-30 aircraft (commercial versions of the C-130 Hercules), thousands of radio frequency missiles, and related training and services. Meanwhile, the delivery of the UAE's missile defense system may not be complete until 2015. Seeking to block the proposed sale of 900 satellite-guided joint direct attack munitions kits to Saudi Arabia, Senator Charles Schumer said in May 2008, "To most Americans, a well-armed Saudi Arabia is far less important than a reasonable price for gasoline, heating oil, and all other products upon which oil is based." The collective nature of the dialogue is also important because these arms sales are wasteful if Washington does not use its political capital to demand interoperable systems and joint-training programs. Three years into the Gulf Security Dialogue, there are signs that joint defense cooperation is taking root. In June, Gates praised "the unprecedented cooperation between the nations of the gulf." Indeed, GCC states are pursuing shared early warning and active defense systems, increasing membership in U.S.-backed nonproliferation efforts such as the Proliferation Security Initiative, signing energy memoranda of understanding, and building on joint exercises like January's joint combined security exercise in Kuwait. Another key component of the dialogue is psychological. The Bush administration used the Gulf Security Dialogue "to convey the U.S. commitment to the peace and security of our GCC allies as well as encourage regional partners to take the steps necessary to address regional challenges." Reinforcing U.S. commitment to defense of the GCC would cement alliances and give the regional Arab leaders the security to side with the United States. As President Bush explained in his 2008 state of the union address, "We will stand by our allies, and we will defend our vital interests in the Persian Gulf." These vital interests are collective. Just as Bush declared a free Iraq to be "a friend of America, a partner in fighting terror, and a source of stability in a dangerous part of the world," so too is a GCC united against Iranian schemes on the Persian Gulf. Such moral clarity helps dispel the competitive monarchies' natural aversion to defense cooperation. Al-Ubeid air base in Qatar and its logistics hub in Kuwait, for example, are crucial for operations in Iraq but would not exist if their host states did not sense a U.S. commitment to solidarity against mutual threats. Bilateral arms deals, too, are precursors to multilateral cooperation: "We sell stuff to build relationships," said Vice Admiral Jeffrey Wieringa, head of the Pentagon's Defense Security Cooperation Agency. As Iran increasingly meddles in the region, trust-building between the United States and its GCC allies grows even more important. President Barack Obama made the cornerstone of his Middle East policy the promise of "a new way forward, based on mutual interest and mutual respect" and "a new partnership" in the Middle East. But Secretary Gates's June 2009 message to GCC defense ministers suggested that the Pentagon does not plan to make any significant changes to the Gulf Security Dialogue. Instead, Gates reiterated U.S. commitments to its vital founding pillars of interoperability, regional stability, energy security, counter-proliferation, and counterterrorism. The U.S. continues its annual exercises in the Persian Gulf, but compared to France—which opened a military base in the UAE on May 26, 2009, and will open an officer academy in Doha in 2011—its commitment to expanding such programs has its limits. Under President Obama, the Department of Defense has announced arms sales to Bahrain, Kuwait, the UAE, and Saudi Arabia totaling more than $4 billion. Yet President Obama's undersecretary of state for arms control and international security, former Congresswoman Ellen Tauscher, signed a 2008 House resolution disapproving of the proposed sale of joint direct attack munitions kits to Saudi Arabia due to concerns over that state's oil policy. It is not clear whether the Obama administration can push such Gulf Security Dialogue sales through Congress even with the Democratic Party's large majority. Nor is it clear whether Secretary of State Hillary Clinton's July 22, 2009 proposal to extend a U.S. "defense umbrella" over the Persian Gulf states signifies a shift away from the Bush administration's desire to see the GCC states able to maintain a more autonomous collective military capability. In 2007, for example, Gates argued that "the most important military component in the war on terror" was "how well we enable and empower our partners to defend and govern their own countries." Nevertheless, Secretary Clinton's proposal has taken pressure off GCC states to cooperate with a June proposal by senior U.S. military officers for a U.S.-GCC agreement on integrated air and missile defense. The 2010 quadrennial defense review (QDR) may signal further changes in the U.S. commitment to Persian Gulf security. While the 2006 QDR called for a shift "from a peacetime tempo to a wartime sense of urgency," a Department of Defense fact sheet on the 2010 review emphasizes a "balance of efforts and resources." The review's point person, Undersecretary of Defense for Policy Michele Flournoy, questioned GSD arms deals in 2007, saying that "it comes at a time when Sunni and Shi'a tensions in the region are higher than they've been in years. It comes at a time when the U.S. is in the midst of a war [in Iraq] where it's having trouble getting the support it needs from its regional allies." In reality, these arms deals have spurred the GCC to help in Iraq. In July of 2008, William Burns, undersecretary for political affairs, praised the "new support and cooperation from [Iraq's] Arab neighbors," attributing it to "the readiness of the Iraqi government and security forces to confront Iranian-backed groups." Indeed, Kuwait, Bahrain, and the UAE have recently opened embassies in Baghdad. Flournoy also warned in April 2009 of a need for "pragmatism" in the face of what she calls "very difficult choices" when it comes to evaluating strategic risk. "In a world in which resources are limited," she said, "particularly in economic crisis, we have to be very specific about how we do this." Such concerns echo the rationale behind the Obama administration's defense budget cuts. While Bush's 2008 budget allocated $188 billion in emergency supplemental appropriations specifically for wartime costs, Obama's 2009 budget allocated only $140 billion. Recession-induced belt-tightening does not explain all the cuts. While the administration believes the economy will gradually recover, the projected wartime supplemental budget gradually drops to $50 billion by 2011. Meanwhile, to pay for increased domestic spending, the Obama administration plans to reduce the military budget from its current 3.8 percent share of gross domestic product to less than 3.3 percent by 2014. This has already required cuts to missile defense spending and F-22 aircraft production. Whatever the justifications for Obama's recent decision not to proceed with missile defense systems in Poland, it is tempting for U.S. allies to perceive it as more evidence of Washington's fading dedication to defense. These decisions send a conflicting message not only to the Persian Gulf states, which depend on a strong U.S. military for security, but also to the Islamic Republic. The Obama administration's decision to engage the Islamic Republic may also undercut the Gulf Security Dialogue's containment initiatives. While it has upheld some of the tough policies of previous administrations towards Iran—such as weapons proliferation executive orders and economic sanctions—the Obama administration is unique in its eagerness for bilateral and multilateral talks. While Bush insisted that negotiations could only follow Iran's suspension of uranium enrichment, Obama has offered to reward talks to Iran "without preconditions." Last May, Obama approved a Bush-brokered 123 agreement to prevent the UAE from enriching its own uranium but has not taken a clear stance against Iranian enrichment. Even after Iran's bloody suppression of post-election protests in June 2009, Obama sent a delegation to meet with officials of the republic last September for multilateral talks with the five permanent members of the U.N. Security Council (Britain, China, France, Russia, United States) and Germany. While the talks secured an Iranian promise to allow inspection of the newly-discovered uranium enrichment plant in Qom and to outsource some uranium enrichment to Russia and France, these capitulations do not mark a change in Iranian behavior but rather an effort to slow international momentum against Iran's nuclear program. Engagement has not quelled the Islamic Republic's revolutionary zeal. The Obama administration used the U.N. General Assembly and the meetings of the Group of Twenty (G-20) finance ministers and central bank governors in September to reassess engagement with Iran. It may resort to economic strategies at the end of the year, such as the "crippling sanctions" that Secretary Clinton threatened in April. Yet any diplomatic engagement that does not occur alongside military strategies will be ineffective and will lead Persian Gulf allies to question the value of further cooperation with Washington. The 2007 national intelligence estimate, for example, said that Iran had temporarily given up its nuclear program in 2003. The change in Iranian behavior occurred alongside the use of U.S. force in the Persian Gulf and was not the result of diplomacy alone. Similarly, the United States's relative success since 2007 in stabilizing Iraq comes after commanders combined a new counterinsurgency doctrine with a troop surge. The June 30 "anti-surge," which confines U.S. troops to their bases, has so far proved unsettling to Iraq's Persian Gulf neighbors. Violence has flared amid Kurdish-Arab tensions in Iraq's north. Attacks in Baghdad killed 147 people on October 25, 2009—the city's deadliest day in more than two years. Meanwhile Al-Qaeda has reemerged in Kuwait where authorities on August 11, 2009, foiled a terror plot against a U.S. base and oil infrastructure. As the Obama administration pursues engagement and lightens the U.S. footprint in the region, the Islamic Republic has maintained an anti-U.S. foreign policy and continues on a steady path of militarization; during his first term, President Ahmadinejad filled two-thirds of his cabinet ministry posts with former Islamic Revolutionary Guard Corps personnel or members of the Basij auxiliary paramilitary force. In an indirect endorsement of Ahmadinejad's reelection in 2009, Supreme Leader Khamenei urged Iranians "not to vote for those who by bowing their heads to foreigners do away with our honor." The IRGC stretched the limits of its apolitical mandate by mobilizing pro-Ahmadinejad voters before the election and beating down protesters afterward. Ahmadinejad has interpreted his reelection as a green light to his aggressive foreign policy. His defense ministry appointee is Ahmad Vahidi, the former Qods Force chief of the Revolutionary Guards wanted by Interpol for the murder of eight-five people in the 1994 bombing of a Jewish community center in Buenos Aires. Ahmadinejad also appointed former IRGC leader Hojjat al-Eslam Heydar Moslehi to the intelligence ministry, and Brigadier General Mostafa Mohammad Najjar to the interior ministry. Meanwhile in Iraq, the IRGC's Qods Force continues to supply improvised explosive devices and explosively formed penetrators—the more expensive explosives that fling special football-size copper slugs through armored vehicles at 2,000 meters per second—to Shi'i militias targeting Americans. Finally, Iran's ever-progressing nuclear program appears little deterred by Undersecretary Tauscher's June 30 threat regarding arms control "to hold accountable those that violate their obligations and commitments." Ahmadinejad's reelection only reinforced these trends. In his September U.N. address (made while reports were still trickling out of Iran of election protesters being tortured and raped), Ahmadinejad blamed the United States and its allies "for spreading war, bloodshed, aggression, terror, and intimidation in the whole region." U.S. policy in the Persian Gulf should recognize that outreach to Iran since the "unclench your fist" inaugural address has failed. Iran has ignored Obama's diplomatic plea for the Islamic Republic to join "the community of nations." Meanwhile, Tehran has capitalized on the June 30, 2009 U.S. troop withdrawal from Iraq: On July 16, an Iranian-backed militia killed three U.S. soldiers in Basra with an Iranian-made rocket. Even though the Obama administration chose not to intervene on behalf of human rights protesters after the June presidential elections, on August 23, 2009, Iran's parliament voted to approve $20 million for exposing human rights abuses in the United States. Iran has interpreted U.S. engagement attempts as desperation: Ahmadinejad's short-lived first vice president and current chief of staff, Esfandiar Rahim Masha'i, said in August that due to Ahmadinejad's "historic" world popularity, "the international community has no choice but to cooperate" with the regime. Finally, as Washington cashes in a peace dividend, Iranian-made missiles and machine guns are landing in the hands of Yemen's Shi'i rebels. In a reference to Tehran, Yemeni information minister Hasan Ahmad al-Lawzi recently said, "There are religious authorities that are trying to interfere in the affairs of our country." U.S. commitment to Persian Gulf security is important because it gives the gulf states the confidence and ability to resist Iranian intimidation. Without this commitment, the Persian Gulf states would accommodate the Islamic Republic. Iran's nuclear program and military ambitions would benefit from such a capitulation as it would give Tehran more access to the region's energy resources and would take pressure off the regime's weapons-trafficking efforts. U.S. policy in the Persian Gulf should continue the Bush administration's successful efforts to strengthen the region's security. Winning the trust of these vulnerable Persian Gulf states requires not only a commitment to arms sales and joint military exercises but also a broader foreign policy that values long-term relationships over shortsighted attempts at "mutual respect" with declared enemies such as Iran. Washington should use the Gulf Security Dialogue to counter Iran's regional ambitions. To this end, the dialogue has indeed made important inroads, especially in coordinating interoperable defense and augmenting the Persian Gulf's arms edge. In April 2008, Bahrain and Kuwait signed their first bilateral security accord. In July 2008, the Department of Defense notified Congress of the possibility of the first GSD-related defense sale to Qatar. But the future success of the dialogue depends on the Persian Gulf's perception of U.S. strategy in the rest of the region. If the Persian Gulf states suspect White House realism will sacrifice their defense on the altar of a deal with Tehran, they may decide they have no choice but to make accommodation with the Islamic Republic, a tendency that ultimately may undercut the U.S. ability to maintain a presence in the region. Indeed, such accommodation is already occurring. The UAE and Qatar were quick to congratulate Ahmadinejad on his reelection victory, and Oman's sultan Qaboos bin Said Al Said traveled to Iran in August. Qatar's emir Sheikh Hamad bin Khalifa al-Thani discussed ways to expand economic cooperation with Iran with Tehran's ambassador to Qatar on August 27, 2009, the day after Iran's envoy to Bahrain called on the Persian Gulf Cooperation Council states to stop "employing foreign forces." The New York Times reported in May that Oman and the UAE increasingly rely on "mutual interest" trade with Iran, which is "an important political and economic ally that is too powerful and too potentially dangerous to ignore, let alone antagonize." Iran's talk of "indigenizing" regional security shows signs of appealing, especially in Qatar. In Bahrain, too, an eagerness to bow to growing Iranian power has taken the shape of bilateral energy agreements. As the Obama administration's experiment with engagement has shown, the Gulf Security Dialogue is a necessary but insufficient measure for countering Iranian aggression. The dialogue is ineffective when conciliatory U.S. gestures towards Iran contradict it. President Obama got it right at his inauguration when he said America must fight its enemies "not just with missiles and tanks, but with sturdy alliances and enduring convictions." Among these convictions is that "our security emanates from the justness of our cause, the force of our example, the tempering qualities of humility and restraint." This is the spirit of the dialogue. The United States cannot negotiate sturdy alliances through barter and concession. It must earn them by denying "mutual respect" to the enemies of America's democratic ideals and standing by those who desire a new way forward. Patrick Knapp is a second lieutenant in the Minnesota Army National Guard. He is currently attending the Military Intelligence Officer Basic Course at Fort Huachuca, Arizona. Michael Knights, "Changing Military Balance in the Gulf," Realclearworld.com, Sept. 15, 2009. Abdullah Toukan and Anthony Cordesman, "GCC-Iran: Operational Analysis of AIR, SAM and TBM Forces," Center for Strategic and International Studies, Washington, D.C., Aug. 20, 2009. "Operation Praying Mantis," Global Security.org, accessed Oct. 5, 2009. Kenneth Katzman, "Iran: U.S. Concerns and Policy Responses," Congressional Research Service, Washington, D.C., May 19, 2009, p. 26. Kayhan (Tehran), July 9, 2007 . BBC Persian, Feb. 16, 2009. Anthony H. Cordesman, "Iranian Weapons of Mass Destruction: The Broader Strategic Context," Center for Strategic and International Studies, Washington, D.C., Dec. 5, 2008, p. 38. Tehran Times, Oct. 30, 2008. Cordesman, "Iranian Weapons of Mass Destruction," p. 15. Marine Corps Times, June 25, 2007. The CNN Wire, June 19, 2009. "Operation Earnest Will," GlobalSecurity.org, accessed Oct. 12, 2009. Martin Indyk, quoted in Kenneth M. Pollack, The Persian Puzzle: The Conflict between Iran and America (New York: Random House, 2004), p. 261. Anthony H. Cordesman. "Conventional Armed Forces in the Gulf," Center for Strategic and International Studies, Washington, D.C., June 23, 2008, p. 37. "Strengthen Relationships," U.S. Central Command, excerpts from testimony before the Senate Armed Services Committee, Washington, D.C., May 3, 2007. BBC News, Feb. 19, 2009. Tariq Khaitous, "Arab Reactions to a Nuclear Armed Iran," Policy Focus #94, The Washington Institute for Near East Policy, June 2009, p. 23. Jim Garamone, "Cooperative Defense Initiative Seeks to Save Lives," American Forces Press Service, Apr. 10, 2000. "Regional Overview and Contributions of Key Allies," A Report to the United States Congress by the Secretary of Defense (Washington, D.C.: U.S. Department of Defense, Mar. 2001), accessed Oct. 14, 2009. "Assistant Secretary Hillen to Travel to Persian Gulf Region," U.S. Department of State, Washington, D.C., May 12, 2006. Los Angeles Times, May 20, 2006. Simon Henderson, "Naval Exercises off Bahrain: Preventing Proliferation between North Korea and Iran," PolicyWatch, no. 1157, Washington Institute for Near East Policy, Washington, D.C., Oct. 27, 2006. John Hillen, quoted in Kenneth Katzman, "Iran: U.S. Concerns and Policy Responses," Congressional Research Service, Washington, D.C., July 17, 2007, p. 33. "U.S.-Kuwait Gulf Security Dialogue Joint Statement," U.S. Department of State, Washington, D.C., May 22, 2007. Katzman, "Iran: US Concerns and Policy Responses," May 19, 2009, p. 41. Robert Gates, Manama dialogue speech, Manama, Bahrain, Dec. 8, 2007. Rachel Stohl, "United States Re-emerges as Leading Arms Supplier to the Developing World," Center for Defense Information, Washington, D.C., Dec. 30, 2008. Christopher M. Blanchard and Richard F. Grimmett, "The Gulf Security Dialogue and Related Arms Sale Proposals," Congressional Research Service, Washington, D.C., Oct. 8, 2008, p. 1. Radio Free Europe/Radio Liberty, July 31, 2007. Kenneth Katzman, "Kuwait: Security, Reform, and U.S. Policy," Congressional Research Service, Washington, D.C., May 20, 2009, p. 6. Katzman, "Iran: US Concerns and Policy Responses," May 19, 2009, p. 42. SIPRI Arms Transfers Database, Stockholm International Peace Research Institute, Aug. 17, 2009. Charles Schumer, "Statements on introduced bills and joint resolutions," introducing S. J. Res. 32, U.S. Senate, Washington, D.C., May 13, 2008. Robert Gates, speech to U.S. Central Command Gulf States chiefs of defense, Washington, D.C., June 24, 2009. Agence France-Presse, Apr. 27, 2009. "U.S.-U.A.E. Gulf Security Dialogue," U.S. Department of State, Washington, D.C., Mar. 11, 2008. George W. Bush, "State of the Union Address," Jan. 28, 2008. Barack Obama, "Inaugural Address," Jan. 20, 2009; idem, interview, Al-Arabiya (Dubai), Jan. 27, 2009. Gates, speech to U.S. Central Command, June 24, 2009. BBC News, May 26, 2009. Gulf Times (Dubai), Sept. 10, 2007. "Kuwait—Technical/Logistics Support for F/A-18 Aircraft," Defense Security Cooperation Agency, Washington, D.C., July 7, 2009; "Kuwait—Upgrade Desert Warrior Fire Control System with GITS II," Defense Security Cooperation Agency, July 10, 2009. The New York Times, July 22, 2009. Robert Gates, speech to the Association of the United States Army, www.Army.mil, Oct. 10, 2007. The National (Abu Dhabi), June 30, 2009. "Quadrennial Defense Review Report," U.S. Department of Defense, Feb. 6, 2006, p. xi. "2010 QDR Terms of Reference Fact Sheet," U.S. Department of Defense, Washington, D.C., Apr. 27, 2009. National Public Radio, July 31, 2007. William J. Burns, testimony before the House Foreign Relations Committee, Washington, D.C., July 9, 2008. Asharq al-Awsat (London), June 11, 2008. U.S. News and World Report, May 4, 2009. Thomas Donnelly, "Indefensible," The Weekly Standard, Mar. 9, 2009. Edwin J. Feulner, "Spending Spree and Cutting Defense Don't Add Up," America at Risk Memo, Heritage Foundation, Washington, D.C., July 20, 2009. FOX News, Apr. 6, 2009. Barack Obama, speech, Cairo University, White House press office, June 4, 2009. Barack Obama and Angela Merkel, Washington, D.C., White House press office, June 26, 2009. BBC News, Oct. 2, 2009. CBS News, Oct. 25, 2009; Army Times, Oct. 25, 2009. American Forces Press Service (Washington, D.C.), Aug. 11, 2009. Danielle Pletka and Ali Alfoneh, "Iran's Hidden Revolution," The New York Times," June 16, 2009. Fars News Agency (Tehran), May 18, 2009. Marisa Cochrane, "Iran's Hard Power Influence in Iraq," IranTracker, American Enterprise Institute, Washington, D.C., Apr. 10, 2009. Ellen Tauscher, remarks to U.S. Strategic Command Deterrence symposium, U.S. Department of State, Omaha, Neb., July 30, 2009. Mahmoud Ahmadinejad, full text of speech to the U.N. General Assembly, Salem (Ore.) News, Sept. 23, 2009; Bloomberg.com, Sept. 24, 2009. BBC World News America, Mar. 20, 2009. CBS News, July 17, 2009. The Washington Post, Aug. 24, 2009. PressTV (Tehran), Aug. 25, 2009. Chris Harnisch, "A Critical War in a Fragile Country: Yemen's Battle with the Shiite al-Houthi Rebels," IranTracker, Aug. 31, 2009. Emirates News Agency, June 14, 2009; State of Qatar Ministry of Foreign Affairs, June 13, 2009; Tehran Times, June 15, 2009. Oman Daily Observer, Aug. 12, 2009. Fars News Agency, Aug. 26, 2009. The New York Times, May 16, 2009. Tariq Khaitous, "Arab Reactions to a Nuclear Armed Iran," Policy Focus #94, The Washington Institute for Near East Policy, Washington, D.C., June 2009, p. 23. Kenneth Katzman, "Bahrain: Reform, Security, and U.S. Policy," Congressional Research Service, Washington, D.C., June 1, 2009. Obama, "Inaugural Address," Jan. 20, 2009. Related Topics: Iran, Persian Gulf & Yemen | Patrick Knapp | Winter 2010 MEQ receive the latest by email: subscribe to the free mef mailing list This text may be reposted or forwarded so long as it is presented as an integral whole with complete and accurate information provided about its author, date, place of publication, and original URL.